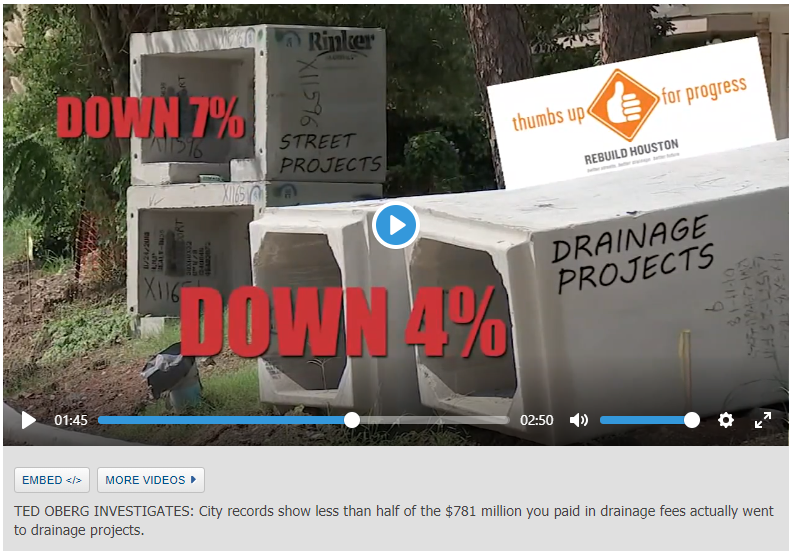 In case you missed it, Channel 13 ran a story by Ted Oberg that exposes what a fraud the Rebuild Houston has become. Oberg obtained documents from the City that showed spending on streets and drainage is down by 7% and 4%, respectively. How in the world can the City be collecting an additional $100 million a year in drainage fees and be spending less money on the very improvements that were promised by this program? PLEASE SHARE THIS WITH EVERYONE YOU KNOW BEFORE HOUSTONIANS ARE ONCE AGAIN HOODWINKED INTO SUPPORTING THIS SHAM.